In November there are days when the rainy weather keeps your kids inside. It’s a good idea to have a few crafty project ideas that you can pull out from your sleeve when the boredom tries to sneak in. The best ideas don’t require too much preparation nor special tools; for this decorated glass jar you will only need a short list of things every paper crafter has in her stash. 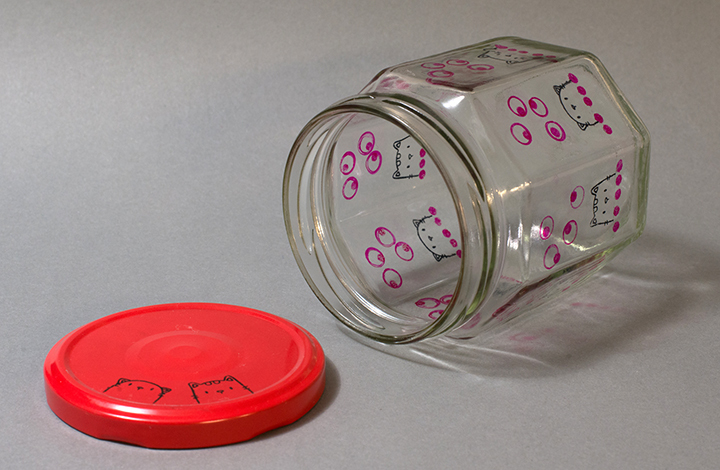 Remove the paper label and wash the glass jar carefully. Wrap masking tape around the jar for easy alignment of the stamped images. 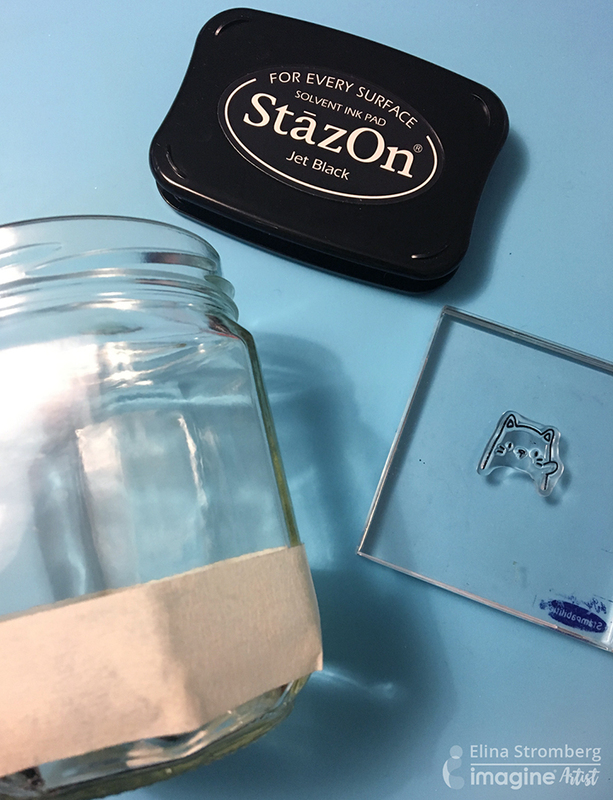 Decorate the jar with stamped images, using StazOn ink. 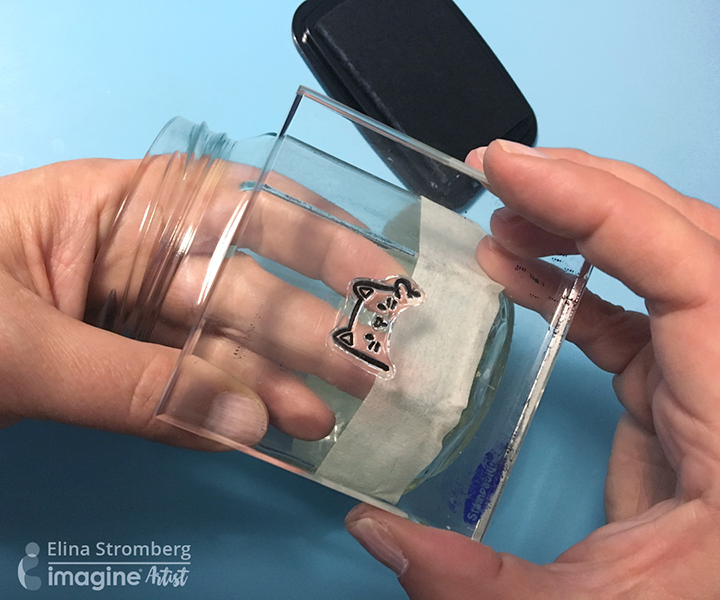 Use a rich amount of ink, but press the stamp gently on the glass for preventing the stamp from sliding on the glass. Should you not be happy with the result wipe away the stamped image with nail polish remover. Continue stamping until the decoration is finished. Use different ink colors. 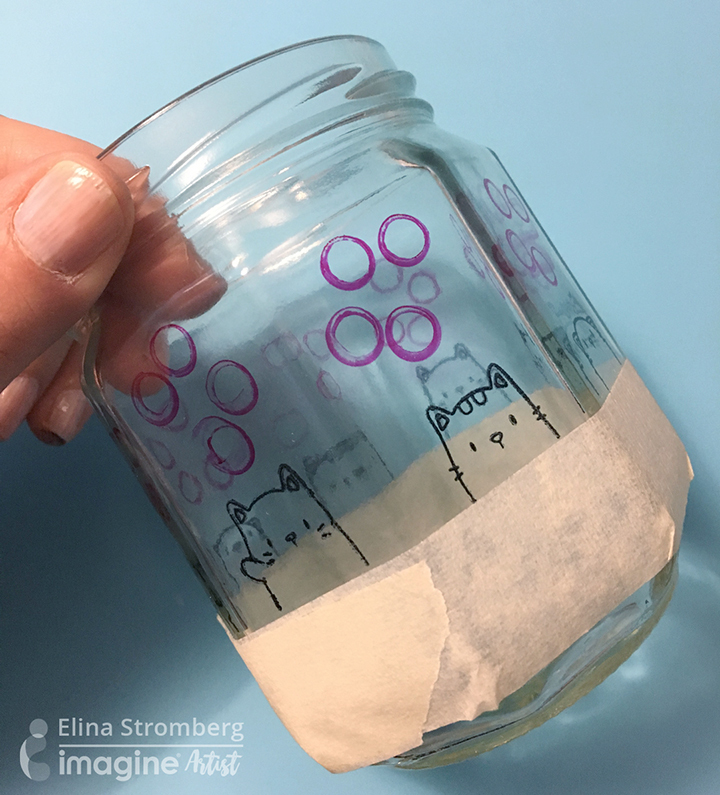 In addition to regular stamps, you can use cotton swabs or various tubes for creating patterns on the jar. Once finished, remove the masking tape. Decorate the metal lid with coordinating accents. Thank you for checking out this tutorial today and if you like what you see then please comment below or share on social media! This entry was posted in Beginner, DIFFICULTY LEVEL, DIY, Elina Stromberg, Home Decor, INSPIRATION, PROJECTS and tagged DIY Inspiration, Handmade, Home Decor, Mixed Media, StazOn. Bookmark the permalink. Awesome technique and result ! Do you have to heat set the ink after you are finished stamping? Hi Mindy – You do not have heat set StazOn, and it should dry fairly quickly, though not as quick as it does not paper! The ink can also be protected further by applying a thin layer of GlazOn over it. https://www.imaginecrafts.com/glazon/no-view/277 Thanks for the question!